Apple Butter is one of those things you can put on everything! Think of it as a thicker applesauce that was slapped in the face with fall spices and maple syrup. I’m talking add it to your toast, ice cream, yogurt, cakes, pies, and cookies! 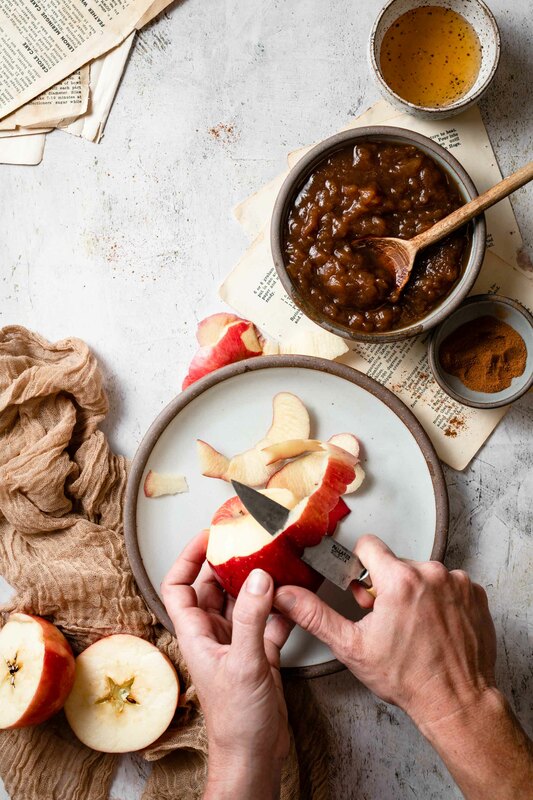 With absolutely minimal effort, you can have a huge fresh batch of apple butter made while you carve pumpkins, rake leaves, or clean your house. This recipe makes about 1,000 ml of apple butter (one wide mouth mason jar full) . So I suggest that you run to the orchard or store, grab some apples, a mason jar, and get to it!! What is the difference between Apple Butter and Applesauce? Both are made by cooking down apples with sugar, spices, and a little liquid. 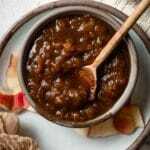 Apple Butter is cooked much longer than Applesauce to create a thick caramelized spread. For ‘step by step’ video visit me on Instagram under highlights titled ‘Apple Butter’! Use a Slow Cooker, for long low heat cooking. A Crock Pot is the perfect ‘make it and leave it’ vessel. Use softer apples like Fuji, Red Delicious, Gala, or McIntosh. Peel, core, and dice your apples into tiny chunks. Sweeten naturally with honey and maple syrup. You can also use all honey or all maple syrup for this recipe. I like to check on my apples every couple of hours and give them a stir. After about six hrs, turn your cooker off. Remove half of the mixture and puree in a blender. You can choose to do half for a more chunky apple butter or blend all of it for a smoother sauce consistency. If you have a small blender, you might have to puree in batches. Be careful with the hot apples!! Add your puree back to the crock pot, giving it a good stir. Turn heat back onto low and let the apple butter simmer for 30 minutes – 1 hr with the lid off to encourage thickening. Once thickened, turn heat off. Let cool and transfer to a heat proof container. I always choose mason jars. Store in the fridge. Will stay fresh in the fridge for about a month. You can transfer to a freezer safe, air tight container and freeze for up to 6 months. Homemade Slow Cooker Apple Butter that is naturally sweetened with honey and maple syrup. 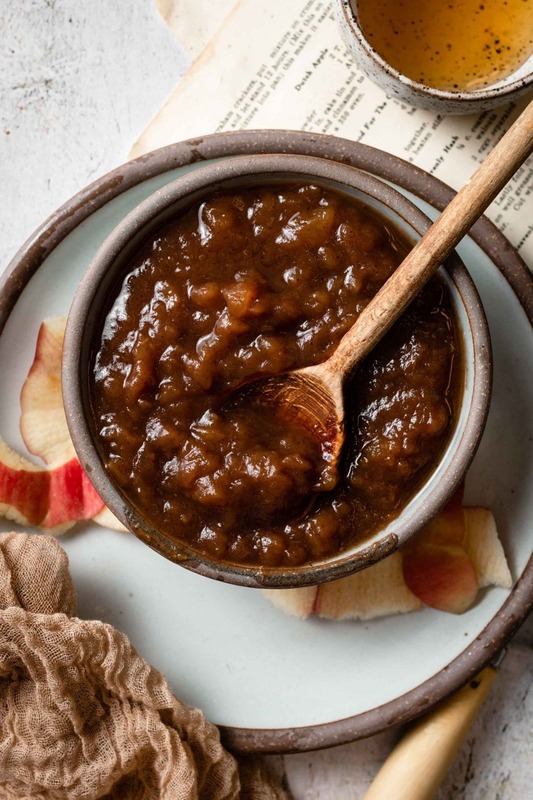 Easy apple butter recipe for spreads and desserts! Set out slow cooker pot and turn onto low heat. In a small bowl combine spices, honey, maple syrup, and vanilla. Stir together until blended. Place apple chunks into pot and pour maple syrup mixture over them. Stir until all apple chunks are coated. Place lid on slow cooker and leave for 6 hrs. (stirring a couple times during cooking). Once apples have broken down into a darker color, turn off slow cooker. Pour puree back into slow cooker. Stir together puree and leftover chunks. Turn heat back on low for an additional 30 minutes to an hour. Leave lid off to help with thickening. Once butter is thickened, turn off slow cooker. Transfer to mason jar with lid.